So, I looked and looked and never saw that the BBC had any coverage of the UGLE's 300 year celebration at the Royal Albert Hall last week—you know, that little shindig with 4,000 Masons from 136 jurisdictions all over the globe, packed into one big room. Perhaps the Beeb's crack reporters were otherwise engaged. 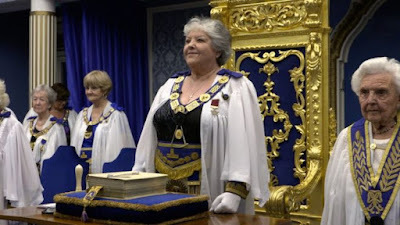 But durned if they didn't manage to work up the gumption to drive across London and check in with the female Masons of the Honourable Fraternity of Ancient Freemasons and the Order of Women Freemasons today. Nothing wrong with that certainly, but I just find the deliberate shunning of the one and the equally deliberate spotlighting of the other to be deliberately irksome. It didn't even mention the tercentenary anywhere in this article, not even as a minor background point. Must have been lost in the edit. 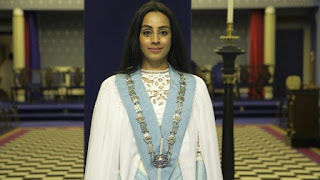 According to the article, there are about 4,700 female Freemasons in the UK, compared to the over 200,000 men. It wasn't all hearts and flowers, though. It's a UK news outlet, so they must have been heartbroken that the women don't have trouser legs, but it still has the obligatory reference to handshakes and police corruption crammed with a crowbar into the final paragraphs. Cheers.